Thảo luận trong 'Octopus/Octoplus' bắt đầu bởi admin, 22/7/16. Octoplus / Octopus Box Samsung Software v.2.3.0 is out!We have added support for Samsung Galaxy A9 '16, Galaxy J7 '16, Samsung Galaxy S7 and other models! - For S7 Qualcomm based phones Unlock is not supported at the moment. Octoplus / Octopus Box Samsung Software v.2.3.1 is out!We have added support for different models of Samsung Galaxy J1, Samsung Galaxy J3, Samsung Galaxy S6 Edge+! Octoplus/Octopus Box Samsung Software v.2.3.2 is out!We have added support for different models of Samsung Galaxy, Samsung Galaxy Amp 2, Samsung Galaxy Express Prime GoPhone, Samsung Galaxy Amp and Samsung Galaxy Sol! Octoplus / Octopus Box Samsung Software v.2.3.4 is out!We have added support for different models of SAMSUNG Galaxy Note 7! Di Động Cần Thơ thích bài này. Octopus Box Samsung Software v.2.3.5 is out! We have added support for Samsung SM-W2014, SM-W2015, SM-G870F0, SM-J710MN, SM-G800I and other models! Octoplus / Octopus Box Samsung Software v.2.3.6 is out! We have added Reset FRP operation for some models of Samsung Galaxy A3, A5, A7, J7, On7, Express 3 and Express Prime! Octoplus / Octopus Box Samsung v.2.3.7 - reset FRP boost! Octoplus / Octopus Box Samsung v.2.3.8 - FRP/Reactivation Unlock for all! Octoplus/Octopus Box Samsung Software v.2.3.9 Release Notes:Added “Factory Unlock” feature! -Devices with "Device Unlock App" (T-Mobile, MetroPCS and AT&T) are not supported and credits will not be refunded! -Sprint, Verizon devices, which IMEIs starting with 99xx are not supported and credits will not be refunded! Improved "Write Cert" operation for Galaxy S6 and S6 Edge phones: fixed issue, when phone IMEI is 350000000000009 and operation stops after "Exploit has been executed successfully". This issue occurs if phone was processed with other tools. Octoplus / Octopus Box Samsung v.2.4.0 - introducing 'Fix Multicore Checksum'! Octoplus / Octopus Box Samsung Software v.2.4.0 is out! We have added support for Samsung Galaxy Folder 2, Samsung Galaxy S7 Active, Samsung SM-T719C Galaxy Tab S2 Plus 8.0 and many other models! Note: All phones, for which "Unlock" operation is not supported at the moment can be unlocked via Factory Unlock service. Octoplus / Octopus Box Samsung Software v.2.4.1 is out! We have added support for Samsung Galaxy S4 zoom, GALAXY Ace 4, GALAXY J1 Mini, Galaxy Tab S2, Galaxy J3 2016 Duos! Today we are proud to introduce a new Reset FRP/Reactivation lock solution via Download mode. We have added world's first FRP/Reactivation lock removal for most Exynos-based devices with new (latest) versions of firmware! Note: this solution may also work for another (not mentioned above) Exynos-based devices. You can try to perform "Reset FRP/Reactivation" operation for un-supported device by selecting any model from the list above. Also note: this solution doesn't work for A3, A5, A7, S7, Note7 phones. We work to provide solution for these phones as well. Octoplus / Octopus Box Samsung Software v.2.4.4 is out! Note: this solution may also work for another (not mentioned above) Qualcomm-based devices. You can try to perform "Reset FRP/Reactivation" operation for unsupported device by selecting any model from the list above. To reset Samsung Account do the following:1. Create a new Samsung account (via PC or via another phone). You should have a working Samsung Account. 2. Perform the Reset FRP/ Reactivation operation. 3. When FRP lock will be successfully reset, wait 3-4 minutes, then go to "Backup and reset" and try to make "Factory data reset" - the phone will ask you to enter Samsung account data - enter Samsung account data, which you have created earlier. If "Factory data reset" can't be done via phone's menu, try to make "Factory data reset" via Recovery mode ("wipe data/factory reset"). 4. Restart the phone and connect it to Wi-Fi. 5. Go to https://findmymobile.samsung.com/ and log in with the username and password (which you have created earlier). There you have to select the phone that was just added to account, select "Unlock my device" and "Unlock Reactivation lock". 6. Restart the phone and enjoy. Octoplus / Octopus Box Samsung Software v.2.4.5 is out! Today we are happy to announce world's first support (Direct Unlock, Read Codes, Read/Write Cert) for the latest firmware version (Security patch level: November 2016) of the most popular Samsung Exynos-based phones. Also added world's first support for Galaxy J7 Prime, Galaxy Tab A (2016) series and more! We have added world's first support for new Tizen phones - SM-Z200F and SM-Z200Y! To enter the P2P Support Area and download necessary torrent files, just click "Go to torrent support" button at "Support & Options" tab in the software. 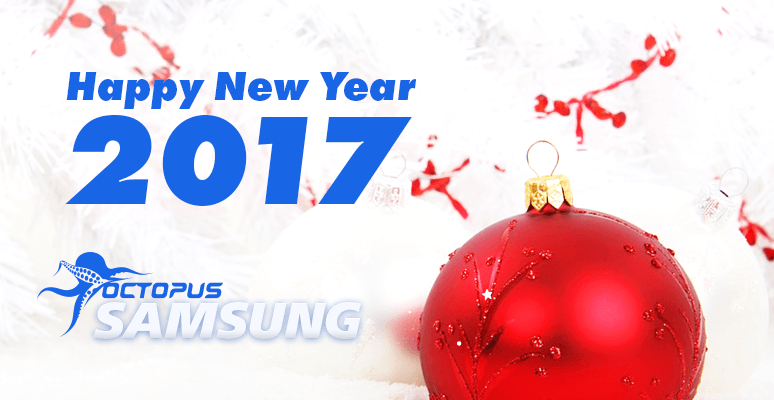 Octoplus / Octopus Box Samsung v.2.4.7 - New Year's eve update! We, at Octoplus Team, extend our best wishes for a joyous holiday season and prosperous new year to you and your families! May the New Year bring new hopes, new promises and new reasons to celebrate your presence in your lives. Have a Joyous New Year! Thank you for every day out of 365 days we’ve spent together. Be sure we will further please you with new regular updates! Please note, that we will be on holidays from December 29th till January 3rd. All support issues will be postponed during this period. See you next year! and world's first support for Note 4 phones with latest security/Android 6.0 versions of firmware. Improved Direct Unlock, Read Codes, Read/Write Cert operation for various Exynos-based phones. On your numerous requests, we have added "Repair Network" and "Repair IMEI" operations for a wide range of devices, based on Exynos CPUs. Please note, that this solution in not permanent and after writing/updating device firmware, it is necessary to repeat "Repair Network" operation, to get an active (enabled) network. This solution can be useful for users, who don’t have proper Cert file. Improved Unlock/Read Codes/Read Cert/Write Cert operations for Galaxy S6 edge+ and Galaxy Note 5 series, based on Exynos CPUs (all available versions of firmware are supported at this point of time). Octoplus / Octopus Box Samsung v.2.4.9 - support for latest Security patches! Octoplus / Octopus Box Samsung Software v.2.4.9 is out!Added World's First unique algorithm/method for processing many Exynos CPU-based devices with the latest security (2017.01.01/2017.02.01 Security patch levels)! Octoplus / Octopus Box Samsung Software v.2.5.0 is out!We have added support for SM-A810F, SM-A810FD, SM-A810S and SM-A810YZ!